On the Podcast this week, it's the first show from the 1951 run, as Dean and Jerry welcome special guest Dinah Shore to the program, as well as new sponsors Anacin and Chesterfield. Coincidentally, we welcome eMusic as a sponsor to the Podcast. Click here for our special free 2 week trial with 35 songs with no cost or obligation. This episode of the Martin and Lewis Show was originally broadcast on October 5th, 1951. The boys abandon the situation comedy format from the 1949 run in favor of a more straight ahead variety show. Writers Ed Simmons and Norman Lear join the crew as well. Dean sings Bella Bimba, Why Did I Tell You I Was Going To Shanghai? and If You Were The Only Girl In The World. Dinah sings My Heart Belongs To Daddy, and the cast has some fun with The Trolley Song. Click here for the MP3 file. 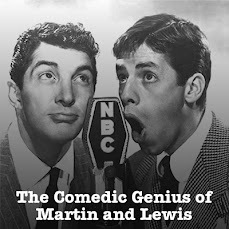 It's Episode 28 of The Comedic Genius of Martin and Lewis Podcast! Bella Bimba, by the way, includes some of my 3 year old daughter's favorite Dean Martin lyrics. Thank you so much for posting these. I always listen to Martin and Lewis before I go to bed. My roommates think I laugh in my sleep. Could you give a shout-out to Josh Miller at Syracuse University please?